Supra came to prominence in the 1970s with a cheap, finely stranded speaker cable. The modern Supra range has been reinvented as a specialist 'boutique' brand, with Sword at the top of their range. Sword's principal technical claim to fame is its zero inductance construction, which is achieved by using 24 individually insulated copper windings, half wound clockwise and half anticlockwise. Note that a few amplifiers (famously Naim designs) use the inductance of speaker cables for stability instead of a Zobel network at the output - using this cable with such a design would be potentially problematic, so check with your dealer if in doubt. 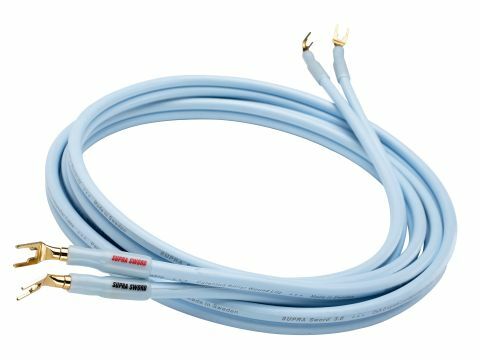 Sword is supplied as a single-wired cable; biwiring means doubling the dose, or using special £175 Supra-made links at the speaker end of the cable. The terminations are crimped connectors, 4mm or spades, with detachable tips. At 9mm thick and supplied in a figure of eight sheath, Sword is neither particularly tractable nor is it inconspicuous. Zero inductance should mean a more phase coherent sound, and as all frequencies are handled identically, there should be no time smearing. That said, this ignores the terminations. Even so, Sword works impressively well. It lacks the resolution or transparency of Nordost Valhalla (but it costs far less and is much more forgiving of system limitations).